Who can afford to mindlessly toss good ingredients in the garbage? Yet that’s what many of us do each time we carelessly chop off cilantro stems and bid them a hasty adieu. The fragrant little stalks carry just as much aroma as their leafy counterparts and lend oomph to this simple, pocketbook-friendly lentil soup, as well as just about any other recipe that calls for cilantro, including the fragrant Peppercorn Cilantro Root Flavor Paste. Thank us later. 1. After you’ve soaked the yellow peas, drain them and place them in a pot with 2 quarts water, the bay leaves, cloves, and 1 1/2 teaspoons salt. Bring to a boil, then lower the heat to a simmer, cover partially, and begin to cook. 2. Meanwhile, in a medium skillet over medium heat, melt the butter. And then add the onion and cilantro stems. Cook, stirring frequently, until the onion softens, about 10 minutes. Add the spices and 1/2 cup water from the simmering peas, and cook until the water has cooked away. Add the onion to the simmering peas and continue cooking until both are very soft, about an hour in all. Remove the bay leaves and cloves and then purée. Return the soup to the stove and stir in the coconut milk. Add the lime juice, then taste for salt and season with pepper. Stir in the chopped cilantro. 3. Bring 1 cup water to a boil and then add 1/4 teaspoon salt and the rice. Give it a stir, lower the heat, and cover the pan. Cook until the rice has absorbed the water and is done, about 15 minutes. 4. In a small bowl, combine the spices with the yogurt. In a separate skillet over medium heat, wilt the spinach in the water clinging to its leaves and then chop it coarsely. 5. To serve, ladle the soup into bowls, divide the spinach leaves among them, then add cooked rice to each bowl and serve with a spoonful of the spiced yogurt. 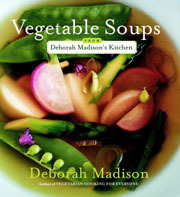 Yellow Pea and Coconut Milk Soup Recipe © 2006 Deborah Madison. Photo © 2006 Laurie Smith. All rights reserved. All recipes and photos used with permission of the publisher.